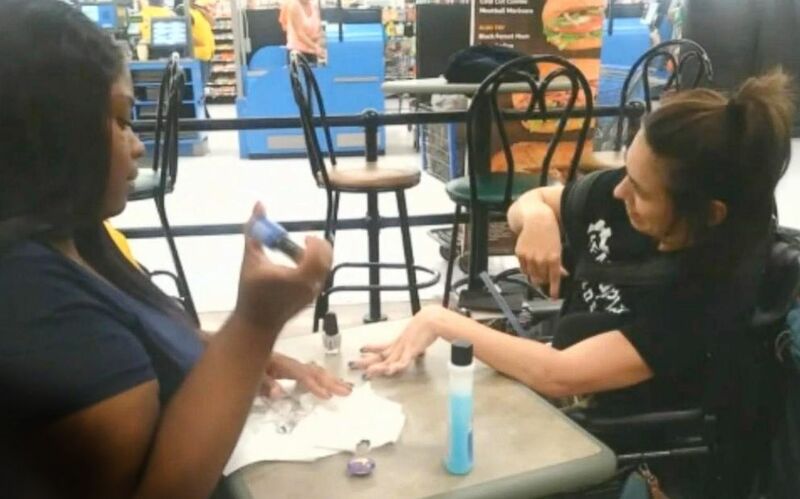 Harris created an impromptu nail salon in a restaurant in the Walmart. 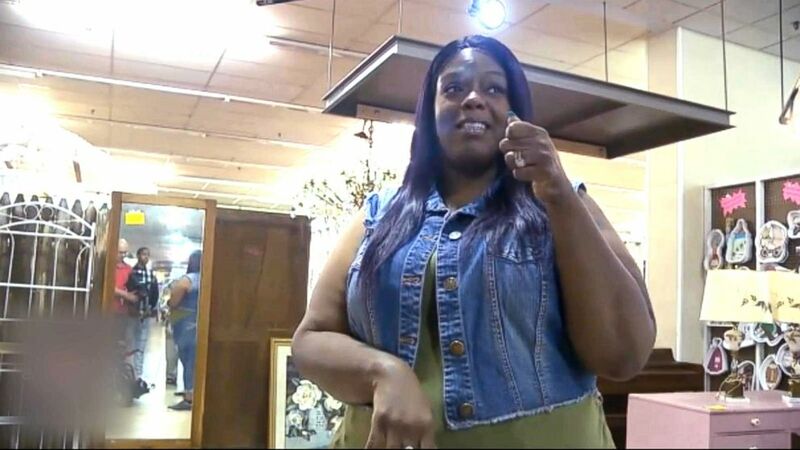 After one of her regular customers, a woman with a disability that sometimes causes her hands to shake, was refused service at a nearby nail salon, Walmart cashier Ebony Harris decided to help. Foregoing her break, Harris, 40, offered to paint Angela Peters' nails for her. The pair picked out a shade of sparkly blue that Peters liked and sat down at the Subway seating area inside the Walmart in Burton, Michigan. "Ebony is a nice person," she told ABC News. "I enjoy conversation with her." 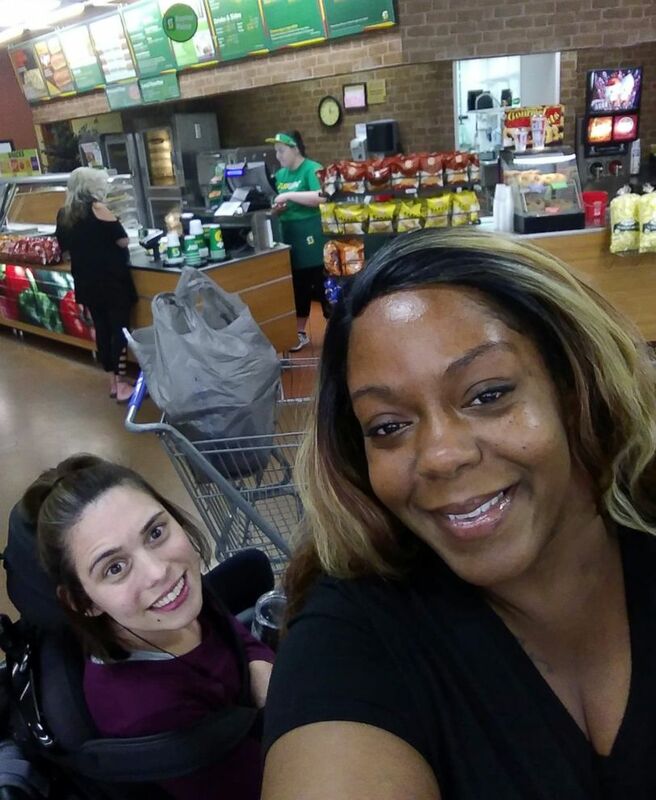 (WJRT) When Ebony Harris saw a woman, Angela Peters, in a wheelchair refused service from a nail salon near her work in Walmart, she decided to help. "I knew her from her coming in here shopping," Harris told ABC News. "I’ve helped her shop a couple of times. I just wanted to do her nails and I didn’t want her day to be ruined." "I was a little nervous and was shaking because I didn’t want to mess her nails up," Harris told ABC News. "She did great, barely moved & was just so sweet," Smith wrote on Facebook. "It’s an absolute shame that they denied her for something so little." "I love it and it hit my soul in a very deep place," she said. "It makes me feel good, but it’s very overwhelming." "Ebony simply wanted to make sure our customer’s day was special, and that’s the kind of person she is -- someone with a wonderful attitude who goes the extra mile each day to make those around her feel important. We're not surprised at her act of kindness. Her service to customers defines the spirit of Walmart, and we couldn’t be more proud,” the company said in a statement to ABC News. "I forgive the nail people for not doing my nails," Peters told ABC News in a statement. "When people do us wrong we must forgive, if not we harbor bitterness. I don't want anyone fired, I just [want to] educate people that people with different challenges like being in a wheelchair, we can have our own business and get our nails done like anyone else." Harris hopes this will inspire others to treat people with disabilities in the same way they would like to be treated. She wants the focus to be "not so much being mad at the nail salon." "We want people to look at the positive side of the story, that there are a lot of good people out here," Harris said. (Angela Peters) Angela Peters and Ebony Harris in Walmart in Michigan.